On Saturday night, I ended up getting quite sick and had to go to the Emergency Room. It seems that I had gotten food poisoning from somewhere. It was a pretty terrible ordeal, and while I’m feeling much better now, I’m still recovering. I had to cancel the playtest session on Sunday because of this, and also didn’t make a perfect loop yesterday. Anyway, just a reminder that you should always take care of your health. 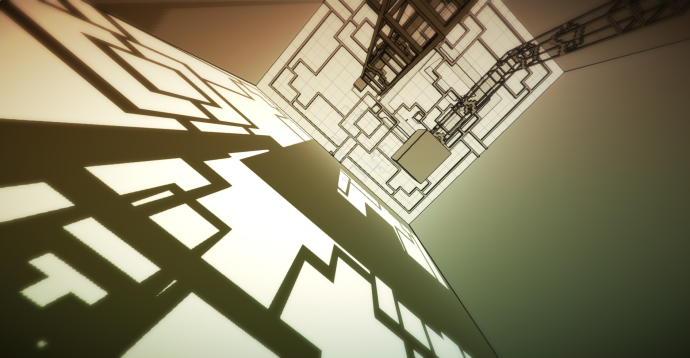 Submitted RELATIVITY to the Experimental Gameplay Workshop at GDC. Keeping my fingers crossed! I stopped by Indie City Coop yesterday and playtested ‘World 2′. 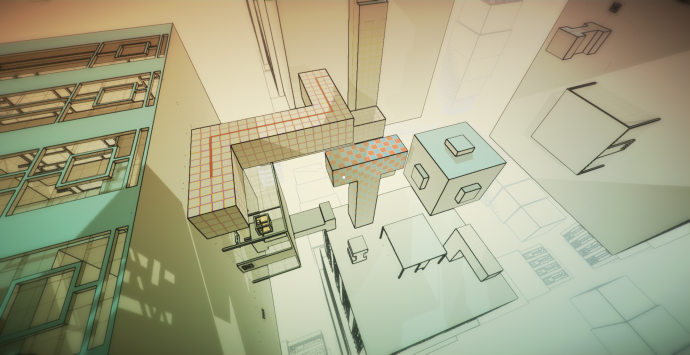 Got some really good feedback and was able to see which puzzles needed to get reworked. Overall, the world works really well. 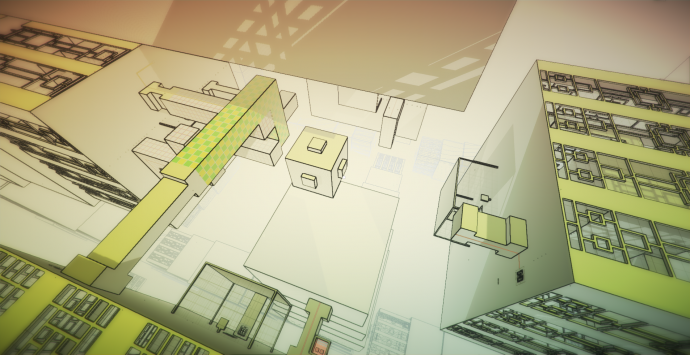 I have another playtest session scheduled for tomorrow, so I’m hoping I can get the changes implemented tonight. Continued to work on World 3 today. 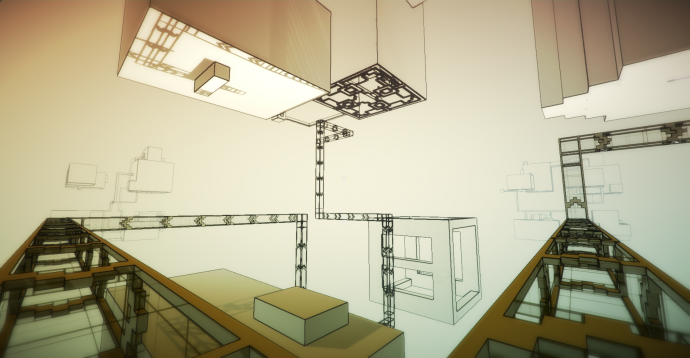 The last time I made this level was back in the summer, I think, so it’s quite rough. 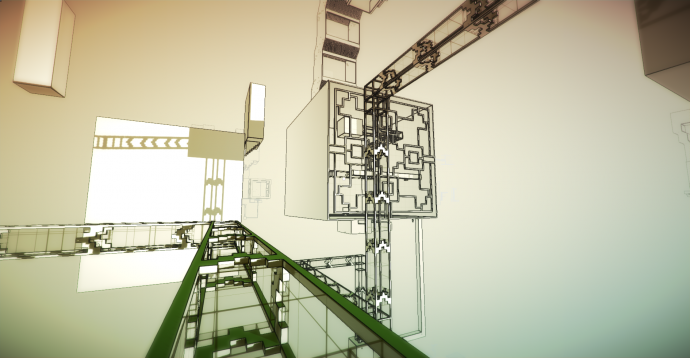 It has been very interesting to return to it with fresh eyes and new knowledge about level design. For example, I use to have this set of stairs that would go down, followed by a flat area, and then a set of stairs going upwards gain. It felt quite weird playing it this time. So what I did was changed the second set of stairs to go down as well, and that made the whole thing feel much better. I think it’s because it continues the mindset of descending, as opposed to breaking it. Also, you don’t usually see a set of stairs going up again after just going down in real life, so it may just be something ingrained in our psychology. 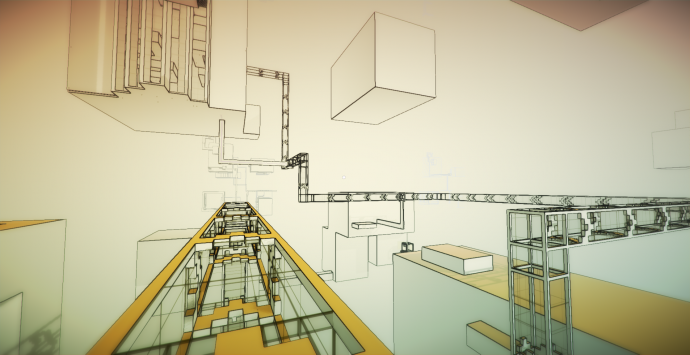 Anyway, I really love this stuff about level design. Also had a idea for a cool easter egg now that I’ve got the in-game console: a text adventure that can only be played via console. I think the only thing kind of close to this is in Call of Duty, where if you find a computer in the environment, you can play Zork on it. But that’s not quite the same thing. I’m thinking of almost like a meta-narrative type thing. Since pulling up the terminal is already breaking the 4th wall, I could sort of play with that. 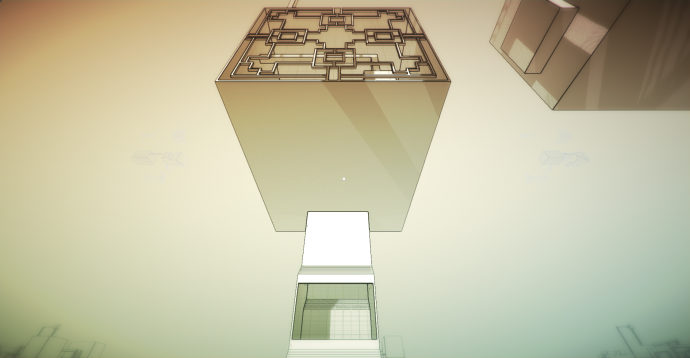 Maybe have some kind of sentient AI figure correspond with the player? It would be quite a bit of work to do it well though. Anyway, having a console definitely opens up a whole world with regards to hiding secrets. 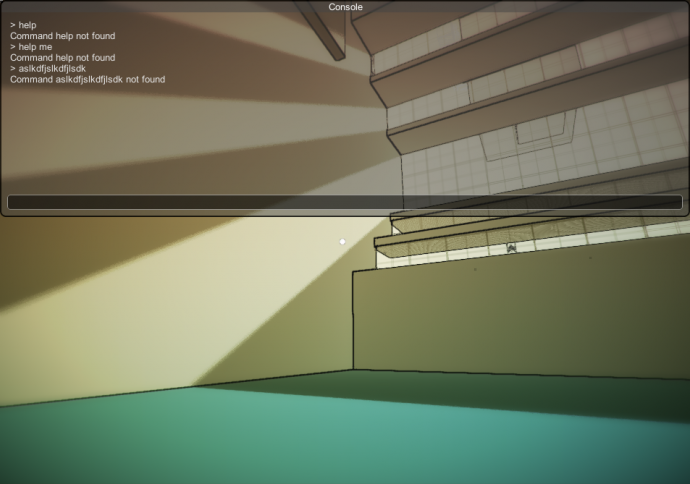 Added a console to the game. Now, you can hit ~ key and it will bring up a console. I’m using it now primarily for debugging and testing purposes. Sometimes player gets stuck in walls, etc. 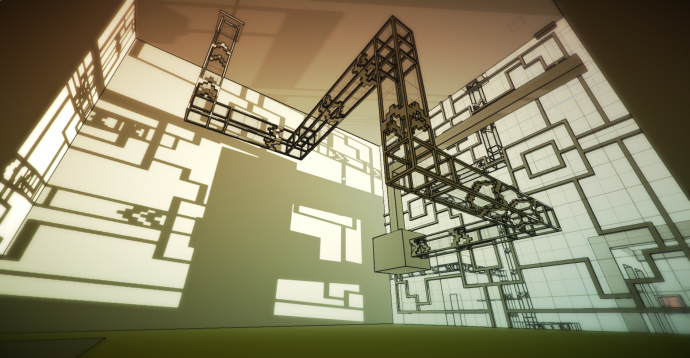 This will be really helpful, especially as I’m now prototyping new levels. I really wish I had done this sooner. For now, I’ll be adding “NoClip” and also the ability to spawn multiple blocks (very rarely a block will fall through the floor). Continuing to capture footage and edit video for EGW submission. This stuff really takes a long time. The nice thing is that it has gotten me to start thinking about what shots I’d like to use for the trailer and how I’d like the trailer to be. 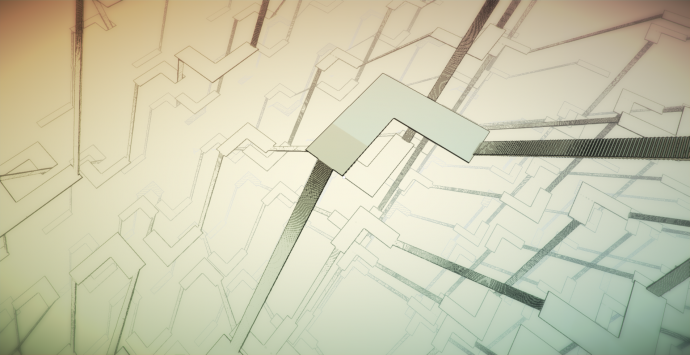 It might be a good exercise to cut together a rough trailer for practice sometime in the next few months. 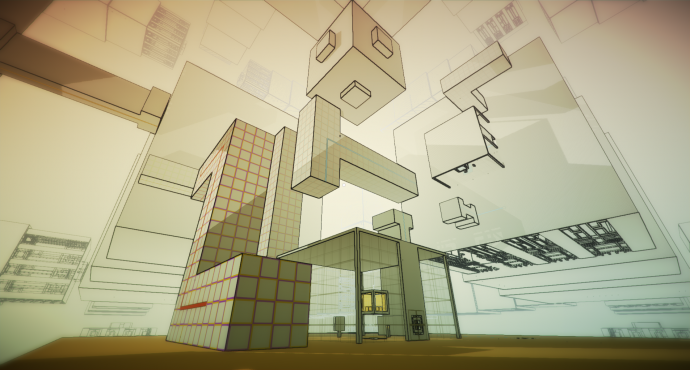 I’m also revisiting an earlier level I made. For now, I’m calling this level “World 3″. Numerical order doesn’t really make sense, because the game opens up pretty early on, and players can choose to go through the different worlds in a variety of orders. It’s more a naming convention I’m suing for now to help with organization. Didn’t make too much progress today with the game. 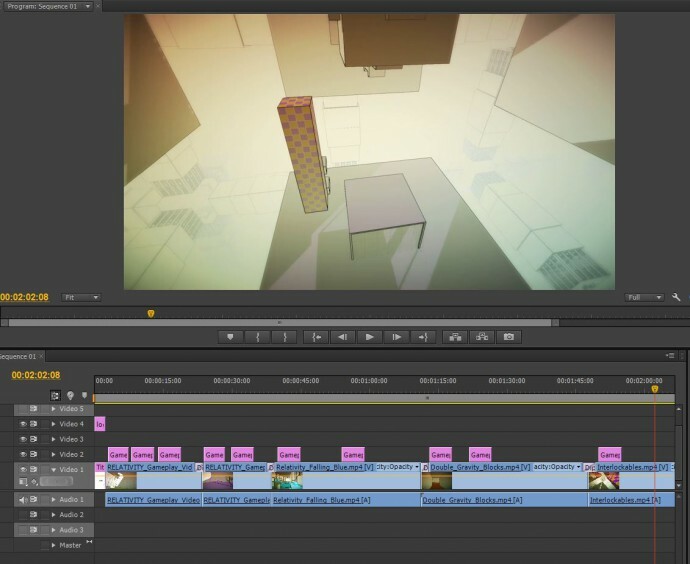 Mostly I was capturing footage and editing my video for the Experimental Gameplay Workshop. Going to try to get my sleep schedule back to normal. World 2 (working title for the level) is now feature-complete. It’s pretty buggy, but it is playable. Let the playtesting commence! It’s probably going to go through at least 10 iterations before I figure out what the right pacing and puzzle sequence is. If I had to guess, it’s probably way too difficult and tedious at the moment. We will see. The important thing is now I have something concrete to work with and can start tweaking the design. 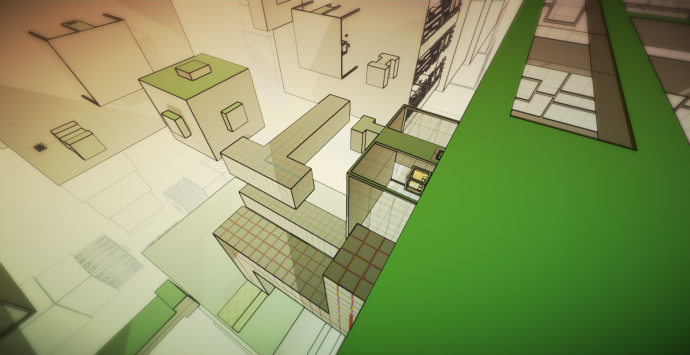 Like World 1, there is also a mico/macro relationship between different puzzles and layers of mechanics. I’m really interested in seeing if players are able to pick up on it. After working on this issue on and off for quite some time, I finally figured out the correct spacing between each repetition instance in the infinite staircase world. The secret is in the L-shaped platforms. They help to even out the spacing and makes it much easier to do then relying on the staircases alone. Finally, here’s today’s perfect loop. Been keeping it up for 4 days so far!